How do bird teams do in the Super Bowl? While others employ sophisticated modeling to pick Super Bowl winners, I’ve taken a different approach: feathers. Specifically, with the Eagles playing the Patriots, I wondered if the past could predict the performance of teams with birds in their name or logo. Well, maybe, and it hits upon an age-old question. Do team names matter? Historically speaking, avians have been some of the biggest slackers when it comes to getting to the Super Bowl. Of 104 combined appearances — including this year’s — just eleven have been bird teams. The Ravens, Falcons, Eagles, Cardinals, and Seahawks represent 15.6% of the NFL but account for just 9.6% of SB appearances. Have birds no work ethic? The recent trend, however, has favored the feathered. A bird made but one lonely appearance in the first 32 Super Bowls between 1967 and 1998. But from 1999 until now there have been a remarkable eleven, an average of more than one every other year. That's the good. The problem is that when they get there, they tend to lose. 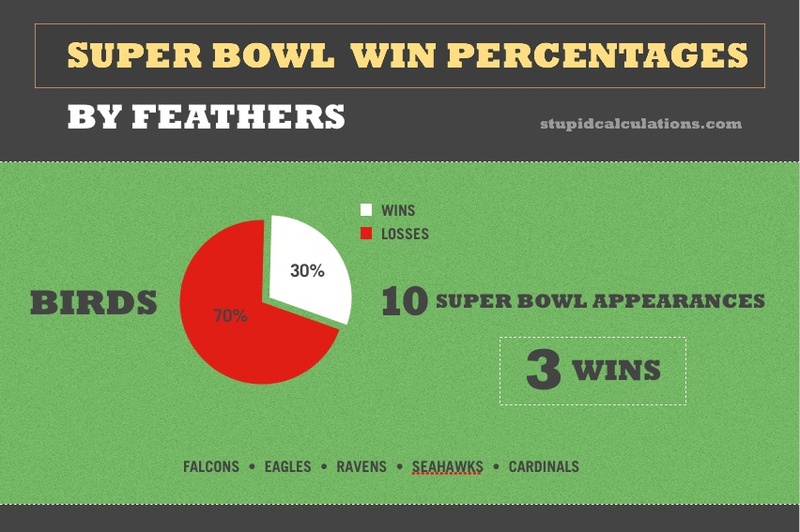 Birds have lost 70% of the Super Bowls they've played with a record of 3 wins and 7 losses. Sadly, there has never been a Bird Bowl featuring two feathered teams. Making matters more dire for the Eagles is the Patriots' dominance over "animal" teams in the Super Bowl. They've played animals six times and won 75% of those matches with the sole loss to the Bears having taken place more than 30 years ago. Against bird teams specifically the Pats are undefeated (3 out of 3). It's interesting to note that the Patriots have never beat a non-animal team in the Super Bowl. Not once. While they feast on beasts, it's only the Giants and Packers that have handed them losses. Moral of the story? Never bet on feathers in February.